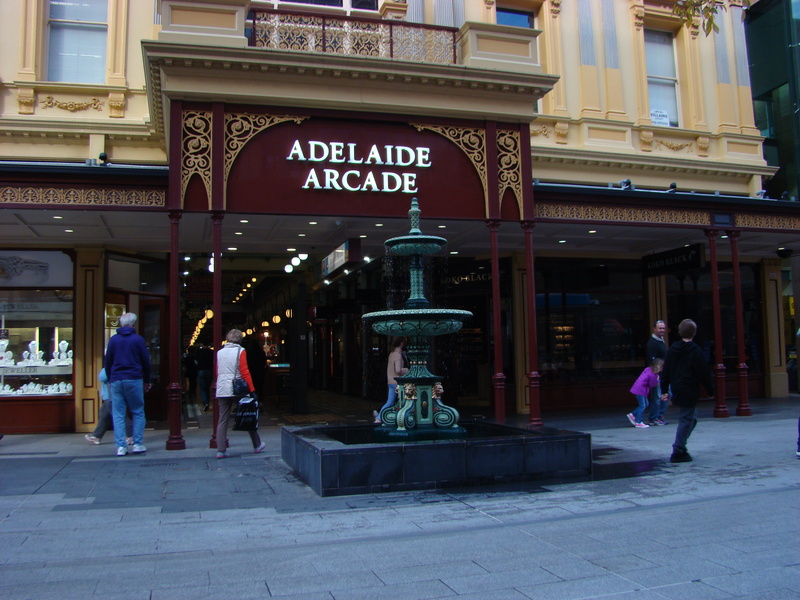 Adelaide Arcade with the fountain in front. Just after 1:30 pm Andrew picked me up and we headed off to Adelaide. We drove directly to Port Wakefield before we stopped for coffee and something to eat. From there we drove to Adelaide – Andrew to his hotel, me to mine. Fortunately both were in South Terrace – The Chifley and the Sage – Andrew in the Chifley. Why not in the same hotel, or even sharing a room? Well this was not a planned trip – Andrew was going down for a meeting so I bummed a lift from him and I just booked to stay where I normally do in Adelaide, whereas Andrew’s room was booked by his company. In the morning I made my way into town – had scones (and butter) and coffee at the Coffee Club in David Jones. Refreshed I went up the road to the Apple Shop to find out what was wrong with my laptop. Here I need to bore you further with an explanation. My Apple MacBook Pro is working fine – it’s great – no problems– however (there’s always a “however”isn’t there?) although it is working very well, it will not upgrade. I am running an operating system that is at least three upgrades behind what I should be running and I am starting to find that some things I download will not operate because the OS is out of date. Why wont it update? Well, that’s what I was seeking an answer to. I didn’t get one – well I got one of sorts. After going through it the tech admitted he had seem nothing like it. Everything is there but it will not upgrade and we don’t know why. They believe that the best solution is to wipe it clean and start with a fresh install then upgrade that to the current OS. That I could not do because I do not have a recent backup, so we are back home again and I will do a backup before I go back down. the Tech to do that for me – probably cost, but worth it. In Adelaide we came across “The Pet Barn” a big pet accessories shop. Well, yes, I did buy some new toys for BJ, one of which was a Dinosaur. 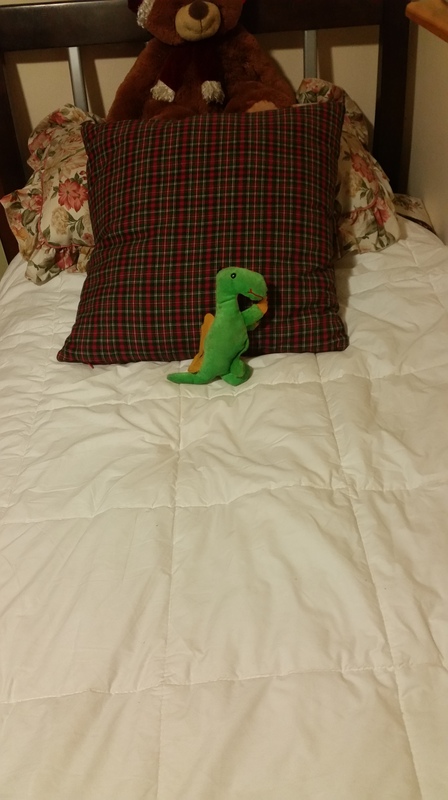 Since I gave him the Dinosaur he has hardly let it go and he takes it up on my bed with him. I managed to get it on its own for a bit and took a photograph. His duck was a bit grubby so I gave it a wash. Came out quite well and the squeaker still works. Although I’ve been in Adelaide the weather up here has been calm and warm – today is a mild 24c and whilst the warmer weather is welcome, it wont last and we’ll be back to cold and wind again soon. However, I did take advantage of the warmer weather to get some work done and this morning I hope to hook up the trailer and get down for a load of Granite Chips and make a start on the back. The WaWa continues to go for Benji and the spray bottle is no longer having any effect; Yesterday was not a good day. The WaWa never shut up the entire day. Spent much of the day outside or driving – always with Benji with me – even if I was going to the hardware store, I took him with me. Keeping him with me and stopping the WaWa from nipping at his back legs has become a constant battle and although I do not wish away time, October can’t come soon enough. Sooah insists she will be back then – I hope so, I really hope so. I have to have something in place before November when I head off back to Mount Gambier and be away for four and a half days and I wouldn’t be at ease worrying about him. At least Benji’s getting extra alone time with Daddy. Yes he does and I really feel that he is happy enough – and we do go together. We just have to keep going until October and see what happens then. I will take the MacBook down to Adelaide and let the Techs work on it so it should all be as eggs-pected. I also hope for a quiet time after October but I guess we will have to wait and see. We cross our paws and fingers together Easy..